The Best Hot Buttered Rum is this recipe I’ve been making for years that starts with a vanilla ice cream and brown sugar batter. Simply warm and add rum and you’ll be in heaven! I have a little recipe binder that I’ve had since I was in my twenties. Yellow with a cross-stitch look to it and plastic sleeves inside that handwritten recipe cards fit into, it is so old and country looking and SO not me today but I love that little binder; it seems that everything that I took the time to include in that book is still something special. None are just ‘everyday’ recipes in the first place but the best part are the great memories that come included as a bonus. Slowly but surely I’m making those recipes so that they are included here but I recently discovered that this favorite for ‘The Best Hot Buttered Rum’ had been segued from that binder to the blog a long time ago as text only and was buried deep in the archives from 1996. That needed to change! I wish I could remember exactly where the recipe came from but I’m certain I’ve had the original since living in North Carolina many, many years ago. Out of curiosity I did a search for Hot Buttered Rum and found references to this same ‘batter’ that I’ve made for so long and I discovered some interesting facts. Seems it was invented by a bartender 17 years ago…who knew? Especially since I’ve been making it not only for our holiday cocktails but for gift giving for over 25 years! Also somewhat interesting was the fact that details for how to make the actual cocktail are a bit sketchy and I think if you followed most of the directions I found you might wonder what the big deal is. The basic mixture may be the same in multiple places; melted butter, sugars and spices are added to softened vanilla ice cream and the mixture is kept frozen allowing for long term use (well, sort of long; knowing it’s there it seems to get used; a lot!). Instructed to ‘fill a cup with hot water’ before adding the mixture along with varying amounts of rum could lead to either cocktail hell or nirvana. Maybe back in ‘the olden days’ people were sketchier with quantities but another truth is that most coffee cups today have such a large capacity that the ratio of water to the other ingredients would be so far off the end result would be a hopelessly watered down cocktail that would not impress; not at all. Never fear, I’ve got you covered! This is anything but watered down but it is a fabulous blend of ingredients that when mixed with rum creates a warming cocktail in more ways than one. Perfect for a night spent cozied up to a fire or to your honey; it’s an old favorite that is just as good today as it was decades ago; my idea of a true classic. I’ve also changed things up on occasion by using warm apple cider or coffee; also very good. 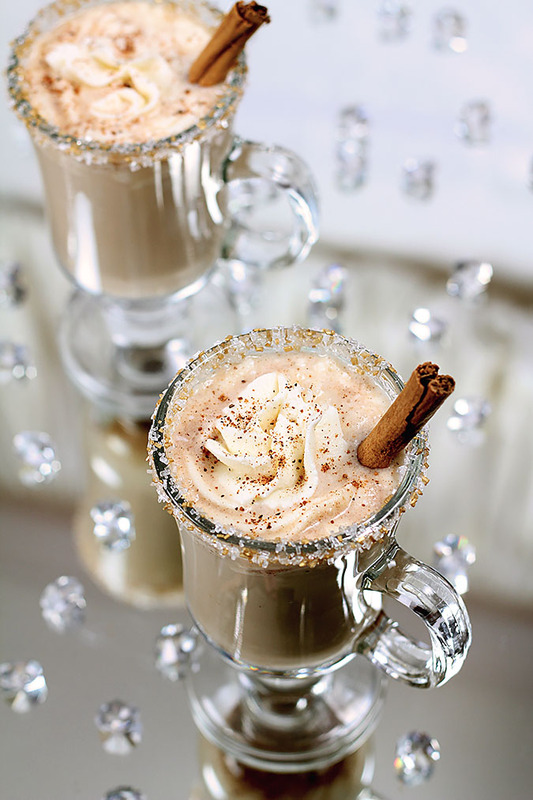 Whatever the liquid component, it’s as easy as heating your liquid, adding some of the batter and rum and finishing with a dollop of rum flavored whipped cream sprinkled with nutmeg. Fun to finish with a cinnamon stick but entirely optional too. I know…simple right? Sure, I rimmed my glasses with a combination of white and gold sanding sugars but hey, you’re not taking a photo of yours; it’s optional! The rum I used for making this cocktail was perfect. My fondness for dark rums continues to grow and I’ve been privileged to sample many I’ve not tried before. Flor de Caña (Spanish for “sugarcane flower”) is a brand of rum distributed by Compañía Licorera de Nicaragua which is headquartered in Managua, Nicaragu. The Flor de Cana 7 Year Old Grand Reserve Rum acquires its amber color, rich flavor, smooth taste and unique aroma aged in small American white oak barrels. Traditional barrelhouses, built without air-conditioning, provide Flor de Caña a natural, undisturbed environment for the flavor to unfold. Every drop of this rum is naturally aged. I knew when I opened this bottle that it would be a good fit for this cocktail; the aroma of vanilla with a hint of citrus almost made it seem meant to be as one of my little secret additions to this classic is the addition of a bit or orange. Perfect. Interested in sharing as a gift? Simple; just package in decorative jars and freeze until gift giving time. Perfect as is for friends or neighbors and for someone more special? Add a bottle of rum for a gift that gives a whole season of warming! Melt butter in a large pan over medium heat. Blend in brown sugar and confectioners' sugar. 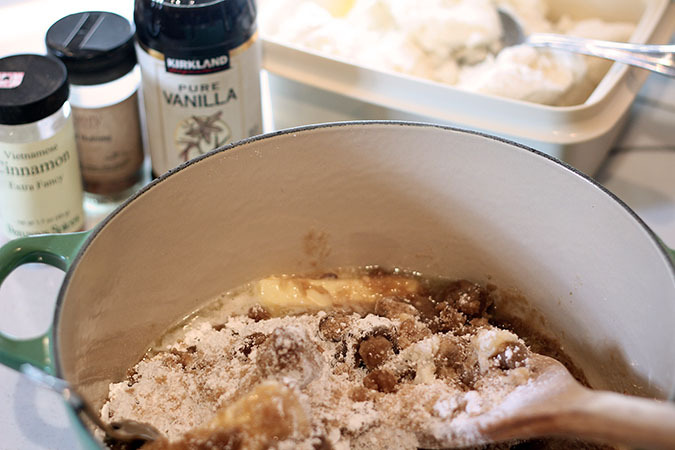 Remove from heat, and whisk in the ice cream, vanilla extract, cinnamon, and nutmeg. Pour mixture into container(s), seal, and freeze. Warm the mugs or glasses to be used by filling with hot water; then empty. Rim the edge of the mug or glass with the cut orange and dip the rim in the combination of white and brown sugars. Squeeze the juice from a quarter of the orange into the mug. Fill the mug with the hot water and then add the rum and the batter. Stir, top with a dollop of whipped cream (optional) and a sprinkle of nutmeg. I want to make a batch to serve at a party. If I follow the batter recipe- how much water and rum should I add? Do you mean to the whole batch Jacob? Or if how much per serving, those numbers are in the recipe. I would use the numbers shown and simply multiply by the servings you want. It’s really best to do them individually or in small amounts to insure the beverage stays warm. I want to make this to send to my brother and his wife for Christmas. I’m in SoCal, he’s in Detroit. Will it be okay to send in the jars you showed? Since a big part of it is vanilla ice cream, you can’t ship it like that unless you’re planning to include dry ice and ship overnight? Quite honestly the only things you could ship normally would be the sugar and spices with instructions to add the vanilla ice cream and butter. It can be stored in any jar that you can find; mason jars are usually the easiest to locate. I think I got those in the photo at Container Store (it was a long time ago!). It’s packed…and I love your name! I’ll go change that if I think of it but just know that whenever a recipe calls for brown sugar, it’s presumed to be packed. Firmly but not hard…if that makes sense? Great choice too…after all these years I still love this stuff! I’m making this for a party and was wondering if I could mix the batter with the water in a big pot so that all people have to do is add rum. That should work, right? Should work Bess; just keep it on a low simmer to keep warm and depending on how long, check every once in a while to see if you need to replace a bit of the water. If you have one you might consider a crockpot even using the low temperature setting. Thank you so much! !n I’m excited to try it tomorrow!! Thanks so much for an entertaining as well as great recipe! I haven’t even tried it yet but I know it will be great on Thanksgiving in 2 days from now! I searched soooo many sites to find the best recipe (I am a good cook), and I don’t even need to taste this to know it tops the rest of them. Hope your holidays are great! would love to make this to give out for Christmas this year — about how much does this recipe make? Wondering how many batches I need to make — thank you! 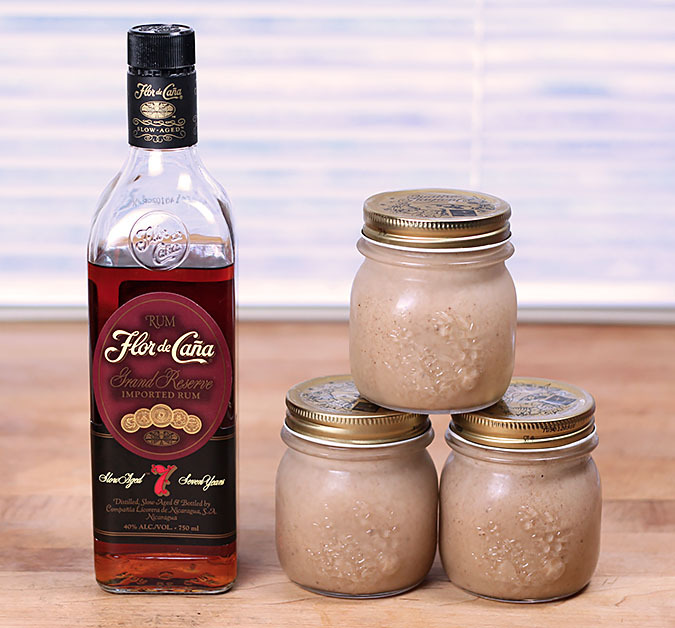 The two ingredients combined make about 40 liquid ounces. I use 4 or 8 oz jars so it all depends on the size of your jars. Quite frankly, the smaller Ball jars are fine and does give you more items for gifting! great, thanks! just made my first batch, and using 8 oz jars, got 11 out of it. so fun! How much batter do you put in the water? It doesn’t say. I’m assuming just a shot glass of rum. The quantity is shown in the recipe; I usually put between 2 and 3 Tablespoons of batter; depending on the size of the mug. You definitely want it to be a rich concoction and not to watery. I tried this last night with clear rum and wasn’t crazy about it. But this morning, I put the batter in my coffee and it was to die for! Thank you for the recipe! There is definitely going to be a difference between using white/clear rum and a dark rum…but you had a great idea; I might have to try that! 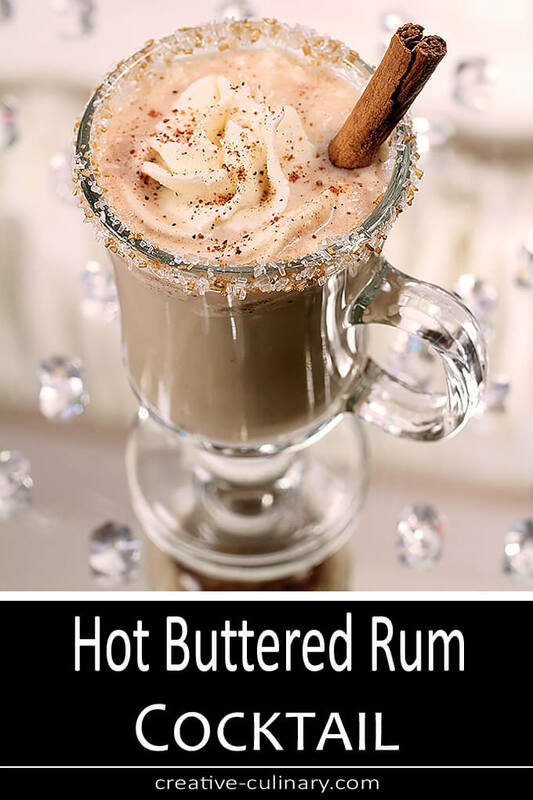 I have always wanted to try a Hot Buttered Rum. I’ve pinned this so I won’t forget where to come to make it. It is so good Stef; a wonderful mixture to have on hand when the urge strikes you for a warm cocktail on a chilly evening. I hope you do enjoy one…or more! I had my first hot buttered rum yesterday at a charming little place in the mountains around Tahoe and fell in love with it. It was a secret recipe so I couldn’t get it out of them so I went to Punchfork and did a search and you were the first one to pop up. I think this is just about identical to what I had! Thank you so much for sharing it. I think there’s a lot of dark rum in my future. 🙂 Now that I know you’re here I’ll check back often. Cheers! Perfect! I think it’s even better than the one I had in the mountains. I added a little powdered white chocolate to the whipped cream mixture. Yummie! OMGoodness. I made this nectar to give as gifts. It didn’t make it out of my house. 2 heaping blobs in a mug, fill with water, microwave till steaming and add rummmmm. I can’t get enough! Maybe next year I’ll have come self-control and share it 🙂 Thanks for the recipe! I love this…I certainly know just how you feel! I gave some away but not all…I must have some for me! I’ve been making mine the same way…so much warmer that way so I’m going to go revise the directions now! So glad you love it! Nice to see this recipe. Haven’t made it in years and was planning to make it for a party this year. Bartender “invented” it 17 years ago? I first made it in the late 70s. I know right? I mentioned that to a friend and can not deny I might have added a bit acerbically, ‘It’s as though none of us cooked before the Internet where everyone has to lay claim to a recipe!’ 70’s sounds about right for me too…or at least the early 80’s. I truly have never known how one makes a hot buttered rum. Had no idea what was in it and now I see that ice cream is one component and I am hooked. Is this a drink or dessert? Or both? I’m thinking late in the evening in front of a blazing fire, an old b & w Christmas movie while it snows outside. And I think I’m in love. Stunning! This recipe sounds so yummy. However, the person I want to make & take this recipe for can’t drink any dark colored liquers. (I want to buy the rum too). Can I substitute the dark rum for regular/clear/white rum? You can Debbie; it will taste a bit different because darker rum has such caramel tones…and it will definitely be a lighter color but I’ve done it before and it’s still good. This looks rich and decadent! This sounds AMAZING!!! I am falling all over myself with excitement for this drink. Seconds before writing this comment I was just telling my husband that we MUST try this. Neither one of us are big rum drinkers but this sounds out of this world incredible. I’ll be making batter asap and have a feeling I’ll have a stock in my freezer all winter after our first taste. Lovely Barb! Where have I been? I have never heard of this drink and what’s not to like– rum, ice cream, butter, and more. Such a pretty photo it belongs in a magazine. Nice photos! And an interesting recipe. I make a hot buttered rum as well, but mine is a bit different. More spices, no ice cream, and not quite as sweet. But this looks terrific! Really like what you’ve done with this recipe — it looks fabulous. Good stuff. Thank you. Oh what a decadent drink and a great gift idea!! I’m really loving the sparkle in your photos… so pretty!! I wanted it sparkly for sure…looks like I got what I wanted hmm? Oh man… I haven’t had buttered rum in years! It’s time!! Now that I have an entire batch in my freezer wish I could just invite you over. I have enough for many! Barb, you have outdone yourself! The photos are AMAZING and this buttered rum looks really, really tasty. I have never made this, but would love to give it a go after looking at your recipe. Normally I would pass on a drink with rum in it but not this time. Love how this comes together Barb and I love how you rimmed the glass. P.S. 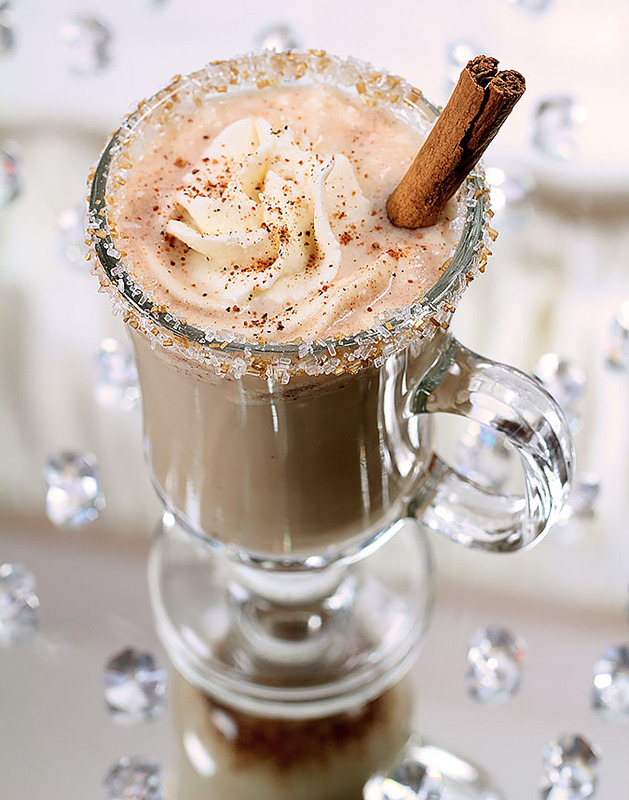 You don’t fool around when it comes to cinnamon do you? Vietnamese Extra Fancy…must be lovely. Oh this does sound divine in contrast to the hot buttered rum my grandmother used to make with water, butter, sugar and rum. I never thought that even sounded remotely good. Now, this recipe I get. This is almost too good and there is nothing about it that doesn’t require a designated driver. Come over; I’ll make you one pronto. Yum. My friend gave me a jar of this years ago… it didn’t last long… and I never knew what was in it except ice cream! Thank you so much for the recipe! You are most welcome Mimi…SO glad when someone is excited for the recipe.